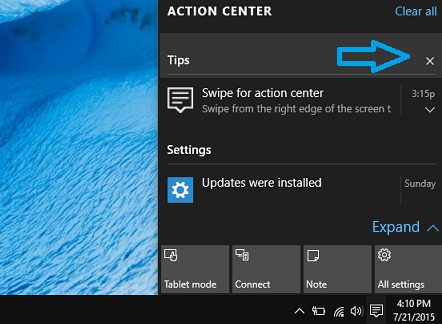 Click on "Action Center" icon on taskbar on lower right side of your screen to open Action Center screen. 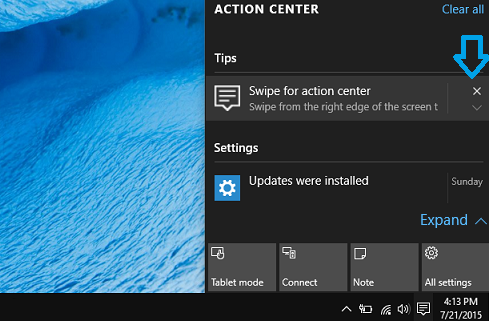 Clear all notifications from Action Center: Click on "Clear all" link on upper right side of Action Center screen to clear all notifications from Action Center. 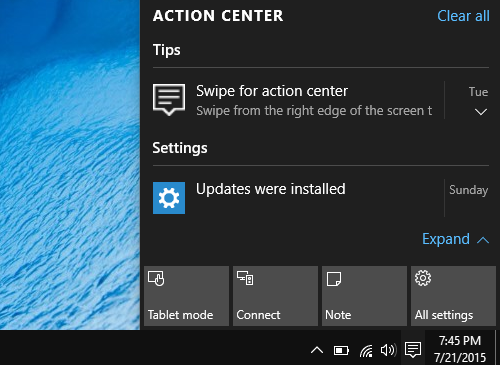 Clear or remove all notifications of individual App: Hover on App name in Action Center and click the close(x) button next to specific App to clear all notifications for App. You can also select individual App and drag it off screen to the right. Clear or remove individual notification from App: Hover on individual notification and click the close(x) button next to it. You can also select individual notification and drag it off screen to the right. 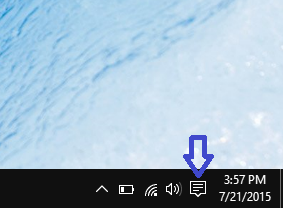 You can use this feature to get rid off unwanted notifications from Action Center on your Windows 10 computer.